When you walked into Turtle Tower, don't expect the usual pho where the bowl is flooded with bean sprouts, mint leaves and lime. At this Northern style restaurant, you will only find clear broth soup accompanied by green onions, coriander leaves, thinly slices meat and of course noodles. 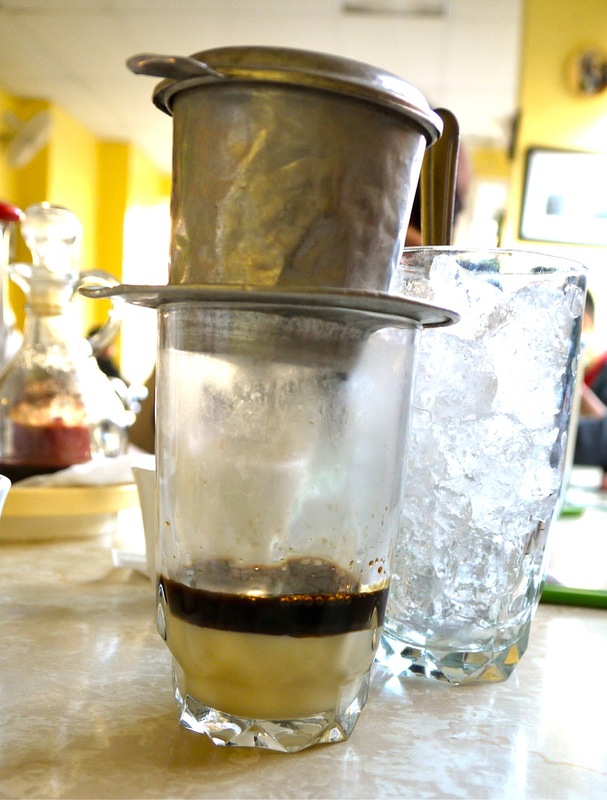 Iced Vietnamese Filtered Coffee (US$3.20). The freshly ground dark roast coffee are individually brewed with a small metal filter drip, yielding a cup of incredibly rich, smooth sweet concoction. Vietnamese coffee is not for the faint of heart as it is much stronger than the usual Western style coffee. Pho Chin (US$6.20) - Well done flank and Brisket Beef Noodle Soup (US$6.20). There are three important elements to make up a good bowl of Vietnamese noodles: clear fragrant broth, silky soft noodles and succulent meat - Pho Chin fitted just right in. Pho Bo Dac Biet (US$7.20) - Combination of rare beef, tripe, well done flank and brisket noodle soup. The broth needed no additional seasoning or garnishing, it was good, warm and satisfying. As you can see, Northern style pho tends to be simpler and is made with less ingredients compared to Southern style pho. I love all of those greens in Vietnamese soups. I was in Vietnam last week and went all out for their coffee. I have to agree with you that its on a strong side but I was fine with the taste. I also visited one of their coffee processing outlet and got the inside details of how Vietnam product so many different types of coffee for export. That Beef noodles was another hit among my friends and they loved the taste very much. I can't say the same because I don't eat beef but sure the noodles looked so inviting. OOo... I'm going Hanoi in March. Maybe you can let me know some good places to eat. ooh noodles/soup would be good for me to have right now actually as I have a headache. Although it's very hot outside. Wow the pictures of the pho has got me craving for some! Delicious!